While the researchers of the original study never recommended the once-a-day aspirin regimen, the pharmaceutical industry immediately began a massive press release campaign that distorted the research report. The press releases at the time gave the impression that the daily aspirin was a sure-fire way to prevent heart attacks. The news was picked up by most newspapers and even medical doctors began “prescribing” aspirin as a preventive measure. * other side effects can include anemia, bleeding ulcers, confusion and dizziness, and numerous other problems. A new study confirms the risk of aspirin and says that the supposed “benefits” don’t apply to most people. In fact, according to the authors, people without a history of cardiovascular disease (such as heart attack or stroke) are unlikely to benefit from a regular dose of aspirin, given the associated risk of internal bleeding. 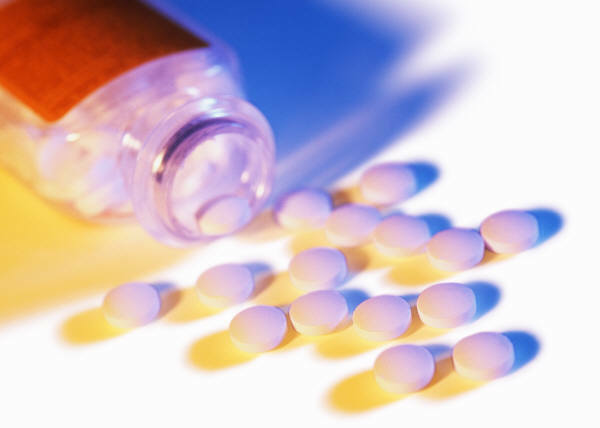 The research, published in the Archives of Internal Medicine, January 9, 2012, is the largest study to date on the effects of aspirin in people without established cardiovascular conditions. 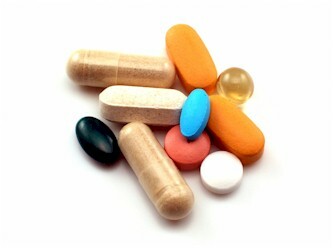 Researchers from Professor Kausik Ray’s group at St George’s, University of London investigated the drug’s effectiveness in primary prevention and the prevalence of side effects. They also assessed whether aspirin had any impact on the risk of death from cancer among people considered at risk of cardiovascular disease. They analyzed data from nine clinical trials involving more than 100,000 participants without a history of cardiovascular disease. Half of the participants took aspirin and half took a placebo. The average participant in the aspirin arm of these trials took aspirin for about six years. The researchers found that aspirin in conventional daily or alternate day doses reduced the risk of total cardiovascular disease events by just 10% – and this was largely due to a reduction in non-fatal heart attacks. It did not result in a reduction in other cardiovascular disease events, including death from heart attack or fatal or non-fatal stroke. The study also showed that this benefit was almost entirely offset by a 30% increase in risk of life-threatening or debilitating internal bleeding events. This means that while one cardiovascular disease event was averted for every 120 people treated with aspirin for about six years, one in 73 people suffered from potentially significant bleeding during the same period. No chiropractor – or any other wellness provider for that matter – can deny the fact that stress is probably the single greatest deterrent to good health and long life. Ample research has been done to show that chronic stress (and even some incidents of short-term acute stress) can affect nearly every system in the body and suppress cellular immunity. Last year, a study found that stress can also wreak havoc on the trillions of bacteria that work and thrive inside the digestive system – bacteria which play a significant role in triggering the innate immune system to stay slightly active, and thereby prepared to quickly spring into action in the face of an infection. The new study appeared in the journal Brain, Behavior and Immunity. Bailey and colleagues turned to mice to better understand the roles that bacteria play in immune balance. They ran a series of experiments using a common stressor for these animals. For two hours daily for six days, an aggressive mouse was placed in a cage of a group of more docile mice. At the end of the string of experiments, blood samples were taken from both stressed animals and matched mice from a control group, along with samples of material from inside each animal’s intestine. The blood samples were analyzed to detect the levels of two biomarkers used to gauge stress: a cytokine called interleukin-6 (IL-6) and a protein called MCP-1 that summons macrophages, or scavenger cells, to the site of an infection. From the intestinal samples, Bailey’s team could determine the relative proportion of at least 30 types of bacteria residing there. Compared to the control mice, the stressed animals showed two marked differences: The proportion of one important type of bacteria in the gut – Bacteroides – fell by 20-25% while another type – Clostridium – increased a similar amount. Also, levels of the two biomarkers, IL-6 and MCP-1, jumped 10-fold in the stressed mice, compared to controls. The researchers then treated stressed mice with broad-spectrum antibiotics that could kill as much as 90% of the intestinal bacteria for a short period. When they again looked at the two immune biomarkers in the stressed mice, they saw only a doubling of IL-6 and MCP-1 – an increase only one-fifth as much. He said that the research shows that some of the changes in systemic immunity in the body can be influenced by changes in these bacterial colonies, a result that reinforces the idea that they have a broader effect on the immune response. The next step, the researchers say, is to better understand the roles that the bacteria play in activating the immune system, and to determine if other factors are playing a key role in the process. For the medical community, that step will likely involve the development of new drugs but for chiropractors and other wellness providers the next step is (as always) to get to the root of the problem: addressing the stress itself and the subluxations caused by that stress. Regular adjustments – along with patient education and other wellness approaches like massage, yoga, and meditation – will go a long way to helping patients reduce the physical, mental and emotional stress that impacts so negatively on their health. By making sure we provide that education and access to the proper care, we’ll help them avoid the use of drugs that can exacerbate the problem. To learn about a new online assessment tool that can measure stress along with other indicators of wellness, visit IOMwellness.com. IOM is helping doctors around the country attract new patients, evaluate their total well-being, and perform accurate outcome measurements. It’s been endorsed by leading chiropractic coaches, including Drs. Dennis Nikitow (Certainty Practice), CJ Mertz (Full Potential Leadership), Jason Lord (Housecall), Mike Reid (Chiropractic Masters), Tedd Koren (Koren Publications), Kevin Pallis and Ed Plentz (The New Renaissance), and many others. Resolution: be good to yourself in the New Year! Instead, make it your goal to be good to yourself this coming year (being good to others goes without saying). You can do it in big ways (take that vacation to Tahiti you’ve always dreamed about) or in small ways (treat yourself to a spa day – even if you’re a guy). Recently, I’ve worked with a friend of mine – Susan Sbicca – to start a business that will definitely help a lot of people be good to themselves this year: Millie’s Gelato. Susan’s the former co-owner and executive chef of the award-winning Sbicca Restaurant in Del Mar, Calif., and the Meritage Restaurant & Bar in Encinitas. 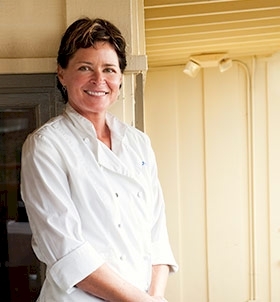 In 2006, she was named Chef of the Year by the San Diego Chapter of the California Restaurant Association and Chef of the Year at the California Restaurant Association Educational Foundation Hall of Fame Centennial Celebration (it was only the second time in its 25-year history that the award has been presented). 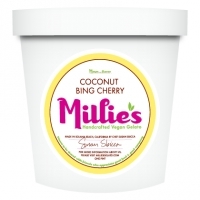 The “Millie” in Millie’s Gelato is Susan’s mom, from whom she gets her love of all things culinary AND her firm belief that health considerations and even dietary restrictions should never stand in the way of a good dessert. Her gelato is definitely a treat worthy of a New Year’s Resolution: All flavors are vegan and most are raw. She uses homemade almond milk, raw agave, Ecuadoran cacao powder, cacao nibs, raw cashews, and natural extracts; raw cocoa butter, organic peanut butter, and Himalayan salt. Plus, she uses only the finest and freshest seasonal cherries, peaches, strawberries, and apricots. She supports local farmers and fair trade practices whenever possible. By the way, there are a few important differences between gelato and ice cream, differences that turn it from a simple dessert into an almost decadent treat. Gelato has far less butterfat than ice cream (about 10% as opposed to 18-26%) so it doesn’t freeze into a solid block like ice cream. It keeps its creamy texture and melts in your mouth with a richness you can’t get from ice cream. Plus, churning is done at slower speeds so there is far less air mixed into gelato (commercial ice cream is actually about one half air!). Millie’s Gelato is made from scratch and hand mixed so it’s thick, rich and creamy! Although Millie’s Gelato isn’t available in retail stores, Susan is willing to ship her Gelato via second day air anywhere in the US! So, make that New Year’s Resolution to treat yourself this year and try some of her Gelato. You might find you don’t need to go to Tahiti to be in paradise. 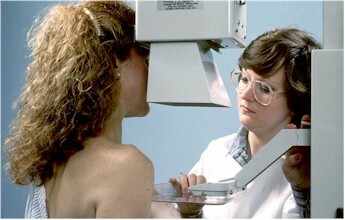 Breast screening is associated with a noticeable increase in mastectomy rates, despite women being told that screening reduces their risk of mastectomy, a study from Norway published on bmj.com revealed. The supposed aim of breast screening is to improve the timing of breast cancer diagnosis, thereby reducing the number of associated deaths. When women are encouraged to have a screening they’re also told that screening reduces the need for mastectomies and increases the potential for breast conserving treatment. However, that isn’t what a team of researchers found. The Norwegian breast cancer screening program started in 1996 in four counties, and from 1999 to 2004 the remaining 15 counties were successively included. The researchers used national cancer data for 35,408 women aged 40 to 79 years diagnosed with invasive breast cancer or ductal carcinoma in situ (a precursor to cancer) from 1993 to 2008. In relative terms, this corresponds to a 31% increased risk of undergoing mastectomy in women invited to screening compared with the non-invited younger age group. Mastectomy rates also fell by 13% in non-invited older women (aged 70-79 years). More recently (2005-08), mastectomy rates declined across all age groups, but mostly for the non-screened age groups. This, say the authors, is most likely due to changes in surgical policy. Americans’ medicines are increasingly manufactured in developing countries, where oversight is lower than in the US, according to a white paper by the Pew Health Group. The US Food and Drug Administration (FDA) estimates 40% of finished drugs and 80% of active ingredients and bulk chemicals used in US drugs come from overseas. The white paper, “After Heparin: Protecting Consumers from the Risks of Substandard and Counterfeit Drugs,” finds that increased outsourcing of manufacturing, a complex and globalized supply chain and criminal actors create the potential for counterfeit or substandard medicines to enter the supply chain and reach patients. For economic reasons, the migration of manufacturing abroad is likely to continue. At the same time, industry and government agencies have failed to adapt to the changing environment. “Today’s prescriptions are being produced under last century’s oversight,” said Allan Coukell, director of medical programs at the Pew Health Group. “Compared with a decade ago, pharmaceutical supply lines stretch around the world and out to a complex web of suppliers. Regulators and industry must modernize supervision of the manufacturing process to ensure the drugs we consume are safe. The “After Heparin” white paper indentifies links in the supply chain that government and business should strengthen,” Coukell added. Substandard or adulterated pharmaceutical materials from abroad have entered the US on multiple occasions. Additionally, the risks of domestic counterfeiting and diversion of stolen drugs are well documented. The white paper presents several case studies, including incidents involving heparin, a blood thinner adulterated during its manufacture in China, counterfeit vials of the anemia drug Epogen and stolen vials of insulin to illustrate the threats and suggest solutions. “After Heparin” is based on public information, including FDA documents, US Government Accountability Office reports, congressional testimony, peer-reviewed journals and interviews with more than 50 supply chain experts and stakeholders. The findings and recommendations were discussed during a two-day convening on the white paper that included a diverse group of industry representatives, ranging from ingredient manufacturers to community pharmacists. SOURCE: Press Release, Pew Prescription Project.